A break, with or without displacement, of the thyroid or cricoid cartilage. Decades ago, a common source of larynx fractures was car accidents, with a person’s neck striking the steering wheel. In this age of protective airbags, the primary source is athletic injuries (e.g., an elbow to the neck while playing basketball). Many larynx fractures are treated conservatively, but occasionally they require repair. Panoramic view shows bruising and marked swelling of the right arytenoid eminence, as well as the right false vocal cord. View of vocal cords shows marked edema and bruising right vocal cord. 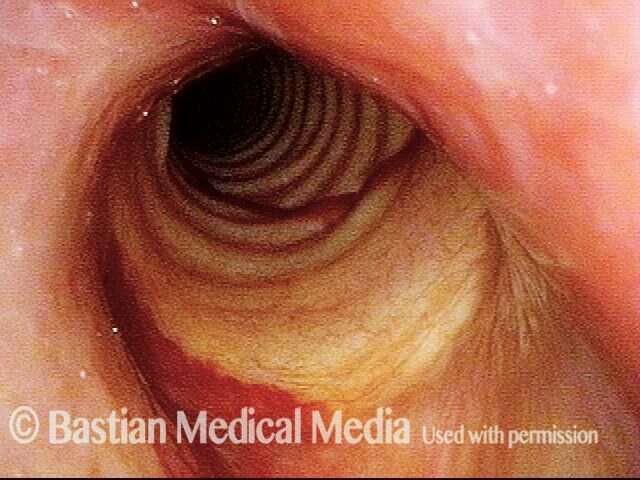 View from within subglottis, and down into the trachea shows bruising. Initial BVI examination, many months after an auto accident with laryngeal fracture. Voice is functional but remains abnormal. In breathing position of the vocal cords, note that tip of the vocal processes of the arytenoid cartilages (denoted by larger dots) are not opposite, but the left one (right of photo) is markedly farther anterior. As the vocal cords approach adducted voice-making position, one can again see dramatic mis-match of the tips of the vocal processes. Closer view as the cords approach voice-making position. The dots again indicate the tip of the vocal process, with the right one (left of photo) just out of view. During phonation, the left vocal process (right of photo) also rides up over top of the right vocal cord (left of photo), and the tip of the right vocal process (left of photo) is again just out of view. This man sustained a sports injury a few months earlier including a blow to the anterior neck. Voice was instantly drastically altered. A fracture is suspected via endoscopic "cues." Here a distant view during breathing shows anterior displacement of the arytenoid apex on the right (left of the photo). Compare the two * for reference. Still viewing from a distance but now while making voice. The arytenoid apices take a more symmetrical position, but the line of the medial wall of pyriform and post-arytenoid area is flattened on the right (left of photo). A shortened vocal cord tends to develop a convex margin, and can either mean the arytenoid is displaced anteriorly, or it could be that the thyroarytenoid muscle has pulled away from its attachment to the arytenoid cartilage. Note here as well that the posterior ventricle seems have been displaced anteriorly on the right (left of photo, at ---). The tip of the arrow suggests where the tip of the vocal process ends. Under strobe light, closed phase of vibration with some phase shifting. To the left of each arrow seems to be where flexible mucosa begins. The foreshortened convex, and more flaccid vibrating segment of the right (upper) vocal cord overlaps the left. Open phase of vibration, with arrows again indicated the junction between vibrating and adherent (cartilaginous glottis) mucosa. Twenty years earlier, during a hockey game, this man’s anterior neck was hit by a puck. His voice has never been the same, and he was told there was a “voicebox injury.” Here, note that both vocal cords abduct fully, suggesting that the crico-arytenoid joint is not likely disrupted, and the PCA muscle is intact. 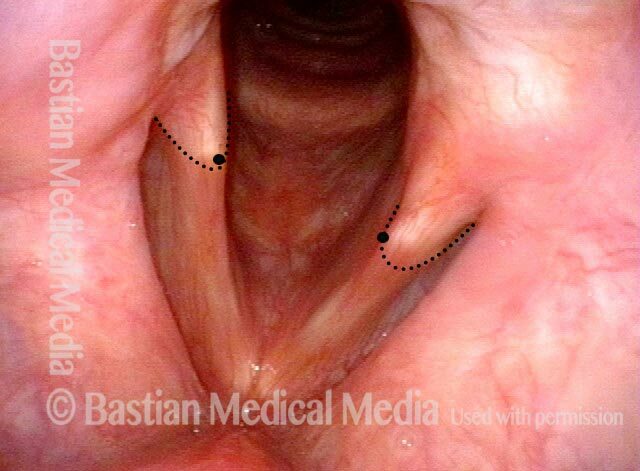 The “smaller-looking “ right vocal cord (left of photo) cannot be due to a disturbed growth plate, as he was in his middle 20’s when the injury occurred. The anteriorly-displaced arytenoid (arrow, left of photo) provides a clue, however, that is explained in photo 4. During phonation, the right cord (left of photo) appears bowed and atrophied. And is that lateral turning of the vocal process that we see? Is this TA + LCA paresis? Read on…. The answer is revealed when the vocal cords approach midline for phonation (under strobe light): Here’s the answer: The tip of the right vocal process (left of photo) is displaced anteriorly as compared with the left. This can be seen by comparing the *’s. The apparent lateral turning of the right vocal process is not in fact of the vocal process, but of the soft tissue of the membranous part of the vocal cord. Open phase of vibration under strobe light shows that the amplitude of vibration is greater on the right (left of photo). To see this more clearly, compare faint dotted lines along the margin of each cord. This “flaccidity finding” is not due to paresis, but instead to foreshortening of the soft tissue (TA muscle and ligament) of the vocal cord. CT of the larynx suggests that the upper lamina of the cricoid is fractured forward on the right, carrying with it an intact and functioning cricoarytenoid joint. Hence, full mobility, yet anterior displacement of the right arytenoid.